With his 500-year lifetime so far, and centuries yet ahead, the character of Dracula has an ever-unfolding biography, to which this 100th-anniversary tribute contributes 33 stories (only 6 of which have been previously published). Dracula visits, in these pages, such locales as the Côte d’Azur, the wilds of Oregon, the Los Angeles of Raymond Chandler, communist Eastern Europe, Rome at the dawn of the 21st century (a chilling tale in which he is forced to imitate the Messiah), and the ruins of post-apocalyptic New Jersey. He encounters Bettie Page, Aleister Crowley, Timothy Leary, Lou Reed, and Francis Ford Coppola (with the entire cast and crew of Apocalypse Now, in a hilarious spoof). The authors include such contemporary masters as Kim Newman, Nicholas Royle, Terry Lamsley, Joel Lane, Brian Stableford, and Ramsey Campbell. 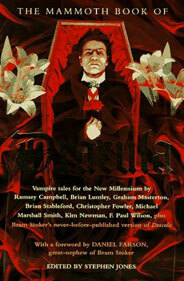 The book also has a foreword by Bram Stoker’s great-nephew, and includes the never-before-published prologue to Stoker’s theatrical version of Dracula.